Male to Male with female adapter coupler. Perfect for analogue and digital TV Freeview connections including HD. Low loss 75 ohm coaxial cable. Gold plated to minimise contact resistance and signal loss. 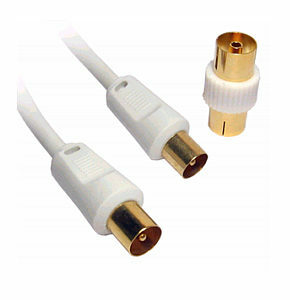 Flat Coax Cable White F-Plug to Plug 0.2 meter. 0.2m flat white satellite lead, f-plug to f-plug cable. 75 ohm coaxial cable. Moulded connectors. Suitable for satellite dish connections Sky, Sky +, Sky HD, Freesat and for Virgin media cable connections etc Flat coax cable to go under windows and doors. Freeview Digital TV Aerial, 48 element wideband digital tv aerial Wideband digital tv aerial suitable for weak, medium and strong signal areas. Silver aluminium finish. Suitable for loft or roof mounting. CAI certified. Cable kit not included, aerial only. SLX 28103HSG Gold 4 way TV Signal Booster / Aerial Amplifer 28103R. Flat gain response across full frequency spectrum ensures optimum digital reception. Fully compatible with Sky/Sky+ digieye/digilink remote control extender systems. Can be used to boost the signal from VCRs, DVDs and satellite receivers. DAB/FM tuner can be connected to any of the amplifier outputs. Features built in Tetra Filters, Surge Protection and Short Circuit Protection. Integrated 4G filter removes interference and channel loss from your TV caused by 4G mobile phone signals. Full VHF compatibility for TV and FM/DAB including Ireland. 12dB gain per port. Noise figure <4dB. Frequency Range VHF/FM/DAB47-230MHz UHF 470-862MHz. 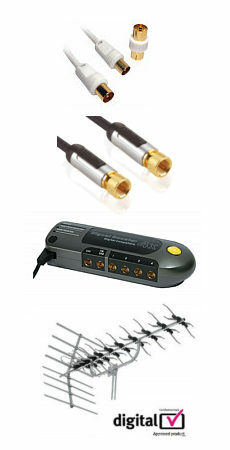 Designed to distribute Digital TV and Digital Radio signals to up to 4 TVs/DAB tuners.